Ready for another instalment of our series on odd campaign posters? Peer Steinbrück’s finger has raised the stakes quite a bit, but since a magazine cover is technically not a campaign poster, I’m not going to dignify this abomination with a link. 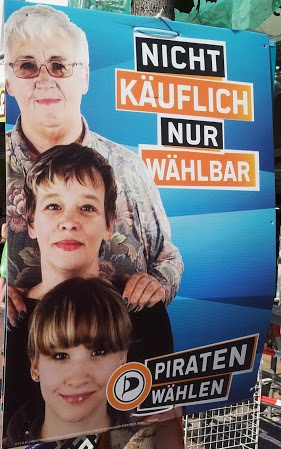 Last time around, I have pondered the question if those people posing for the pirate party are indeed members/candidates, and @senficon has kindly clarified matters a bit. 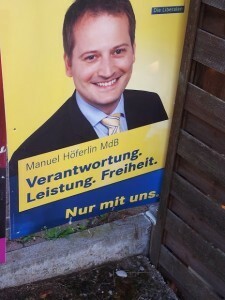 This week, I’m focusing once more on the local candidate for the CDU. While the seat is open (the sitting MP is retiring), it has in fact never been won by the CDU, so a little endorsement from the boss can’t hurt, yes? Thinking along the same lines, our man has put up a large billboard picturing him and the Chancellor. But does it show him with the Chancellor? How Much Time Does a Chancellor Have for Local Candidates? Here is a simple calculation: A professional shooting would take at least 15 minutes per candidate. The CDU is contesting all seats outside Bavaria. That would be 244/4=61 hours. Even if the Chancellor would endorse only those 65 candidates who are running in non-Bavarian districts not won by the CDU in 2009, this would amount to two normal working days. That seems a bit excessive for a woman who – besides things such as popping over to meet the other G20 club members, messing up saving the Euro and running a national campaign – is busy ruling the country. 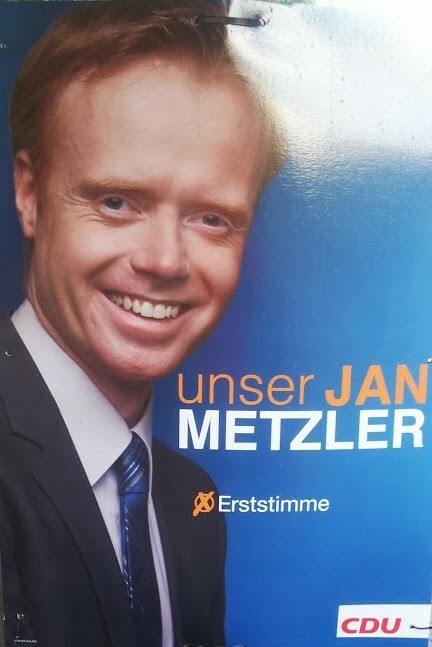 Plus: He looks a lot less streamlined on his own posters: So I was wondering, just wondering if the very capable people at CDU headquarters have come up with a little Photoshop template that candidates may download from some internal server. By the way, “Gemeinsam” means “together”. 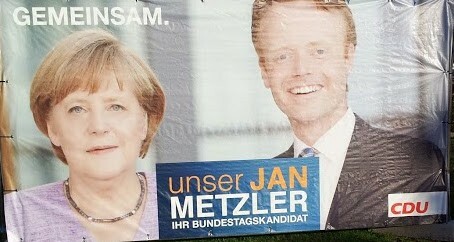 Is that the CDU’s response to the SPD’s ingenious “It’s the ‘we’ that matters”, or a not-so-subtle irony marker? Just asking. We. Liberals. Love. Punctuation. Marks. Responsibility. Performance. Freedom. Pointless. Full. Stops. It is still silly campaign season in Germany, and the new exhibits just keep coming. Here is another one brought to you by the Party Formerly Known As The Guys Who Almost Stood Up Against The Bloody Spelling Reform Back In The 1990s. Incidentally, the party also upset a lot of German teachers back in 1968 when they began styling their logo as F.D.P. (a violation of clause 102, subsection 2 of the German spelling code). They shed the dots back in 2001, when a youngish Guido Westerwelle took over and transformed the party. So possibly, just possibly, Regained. Full. Stops. Between. Buzzwords. Are. The. Message.